This entry was posted in Family, Marriage, Motherhood and tagged Chicago daytrip, Chinatown, lucky cat, maneki-neko, Millennium Park, Phoenix Restaurant by Michigan Left. Bookmark the permalink. Isn’t the pic of my ice skaters awesome? I love it so much I had to Instagram it. And I am a complete Instagram failure. Awwwww 🙂 So sweet! Super dad to the recsue!!!! Haha! Exactly. I don’t know what I would do without that man. Super Dad indeed! Love that you all went ice skating together. When I was growing up in Pittsburgh our entire family went outdoor ice skating every single Sunday from November to March, and those are some of my funniest, fondest memories. That is such a cool family tradition, Samantha. Unfortunately, I don’t skate (and am a huge klutz) and my son isn’t a big fan of it. My daughter, however, takes lessons twice a week and loves it. I hope my husband will hit the ice with her again soon. He’s such a good sport. What an awesome move by Dad. Sounds like the perfect day! What a sweet thing to do! Now they have to go skating together more often! I agree, Ginny. I’m so glad he bought those skates. What a wonderful story! My husband is wicked on hockey skates (but growing up in Boston, he could skate before he could walk). I’d rather be sipping the hot cocoa! Thanks, Stacie. I don’t even know how to skate, but hockey is a huge deal in my hometown of Detroit too. Not so much in the South Suburbs of Chicago where my husband grew up. Aww what a sweet move by the hubby! Go him! Right??? I was feeling like a pretty lucky lady that afternoon. Still am. What a great family day! I look forward to when our girls are a bit older and our family days look a little more like yours. There is nothing sexier than a husband being an amazing father. You go, Super Dad! Your husband? Awesome. 21 days smoke free – more awesomeness. Thanks, girl! I appreciate it. I want nothing more right now than to go ice skating. My kids are a little young for it, but this is inspiring me. Might have to find the nearest rink and head out there this weekend. This line made me smile: “The man had no clue how to skate, but he knew how to make his daughter happy.” As a father, I’m sure it made your husband happy too. Thanks, Jared. I’m not sure if you’re new to Yeah Write, but you are new to me and a welcome addition to the family. And you sound like a pretty awesome dad too. Thank you. Yes, this week and last week are my first forays into Yeah Write. I’ve actually been receiving the emails for quite some time now (I must have signed up at some point, and/or met Erica way back when), but have only now decided to start participating. I’m glad I have. Glad to connect w/ you and others. How could you not fall more in love with him? What a great guy! And, congrats on the success so far on quitting smoking!! You can do this! Thanks, TriGirl. You have to keep doing cool athletic things so I stay inspired, OK? How priceless is that photo?! Both look so happy and satisfied, like your husband knows he did the right thing and your daughter knows she has Daddy wrapped around her little finger. Y’all are awesome. And: I missed your quit-smoking post but make sure you’re drinking tons of water! The faster you can flush out the cigarette toxins the faster you’ll stop craving. Big hug and good luck! Awwww, thanks, Louise. I know I already said it in my comment on your post, but it is so nice to have you back. It’s those little surprises that can make you fall in love all over again. That cat will make you smile each time you see it. Great story. Thanks so much, Kerry Ann. So true about the little surprises. You’re right, Jennifer. Thank you! Super/Clever Dad indeed! I LOVE that picture and I can totally picture the man put there who can’t skate. Oh and i love Dim Sum done right and not everyone does hence the leap. Sweet post. Thanks, Gina. We should meet up for dim sum! Love, love, love this story. It reminds me of how it can be the littlest things that have a profound impact. Thanks so much, Christie. I love the little moments. They really do add up if you appreciate them as they occur. Cool cat, great story. I am sure your daughter will remember that special moment for a long time. Aha! Another appreciator of kitsch. I like you already, Marcy. I’m sure you are right about my daughter. They had a blast together. What an awesome Dad move!! Sounds like your daughter is a lucky girl! Also, congrats on the not smoking!!! Thanks, Michelle. She sure is lucky. I think she knows it too. And thanks for the no-smoking congrats too. I’m very happy about it. 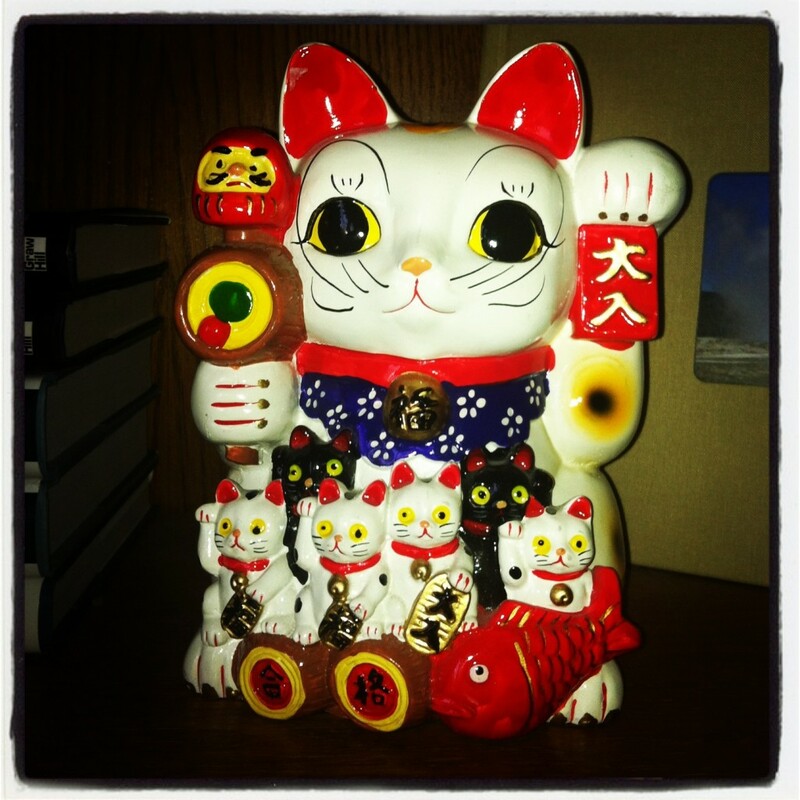 I love your lucky cat! She’s a whole lot fancier than the white ceramic one I have, but rest assured the plain ones aren’t a whole lot luckier! What an amazing thing for your husband to do for his little girl, and what a great memory that made out of what could have been an otherwise boring day. Thanks, Jen. Isn’t she a cutie? I just don’t get why no one but us thinks so. They must not have the appreciation for fine kitsch that we seem to share. Awesome!!! We have to remember moments like this when we are picking up their dirty underwear and socks off the floor or when they are in bed crying because they have a cold…..
Haha! Yes, it’s these tender memories that get us through all the male nonsense. That is the best picture ever. Go your husband! I love the marriage is like dim sum line. 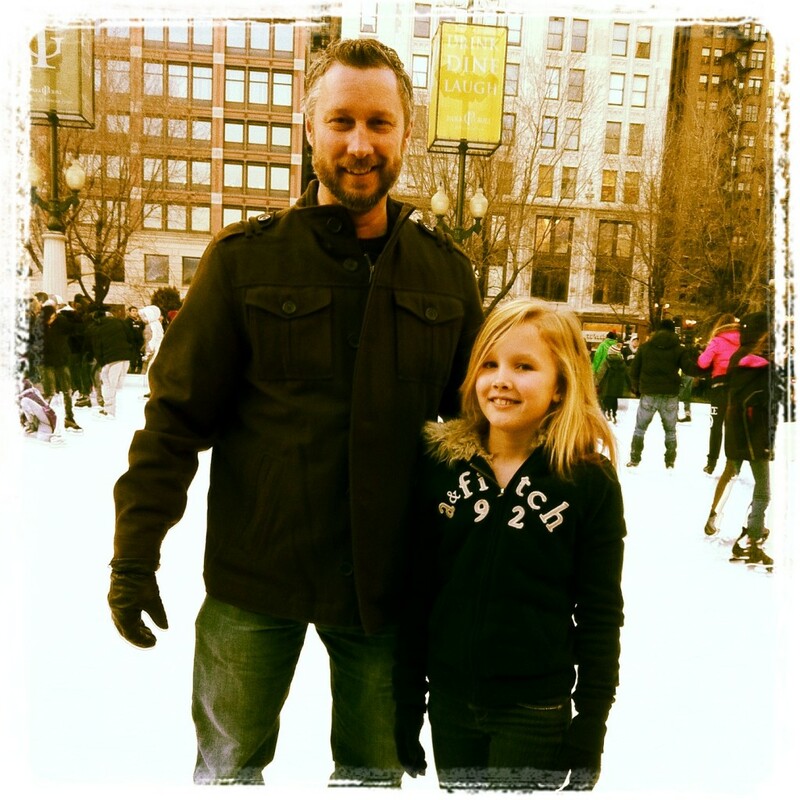 Big oorah to fathers who can’t ice skate but try to because they want to spend time with their daughters. Very cool. I agree, Jack. There’s nothing like quality time with your dad when you’re a little girl. It’s priceless. Hey, congrats on the continued smoke-free living. And this post is great. How you did this without being sentimental or treacly is beyond me. I can’t write about my husband nicely because it makes me want to gag. But this? This is really something. Thanks, Christie, for saying that. I was afraid that it did sound overly sentimental. I appreciate the reassurance and support. Awww, thank you, Ellen. You just made my day! Heck, just the fact that he will GO skating is points in my book. My hubby won’t go. Great story. And now, I want to go skating! Definitely the sign of a rock star dad! Sounds like a fantastic day. It really was. I think I’m appreciating moments like that a whole lot more now that the kids are getting older. I kind of love that cat, even if it isn’t all that lucky. And buying those skates? Total dad win. Thanks, Abigail. I agree on both counts.